This was taken just after their last match of season against Southport and Ainsdale Golf Club. The team was Sue Henshall, Angela Hurst, Sandy Lunt, Pat Smith and Janet Davies (not in the photo). 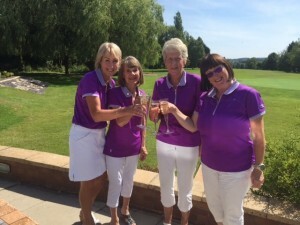 Good luck to the Ladies’ District Championship team who are representing Gathurst at Hindley Golf Club on Saturday. I’m sure they will appreciate your support if you’ve time to drive over there. For those of you who use Facebook the golf club now has a page for you to follow and our results are displayed on there each week. Congratulations this week to Norma who won the competition but also to Wendy who will share the Norah Sherrington Rose Bowl, according to the wishes of the family. The winner of the Frances Smith and Millennium trophy is the player with the best nett score over the two rounds and this year that honour goes to Linda Cubbins with 70 in the first round. Hope she’s available to go forward to the final on the 4th August.